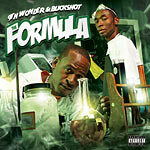 Following the successful ''formula'' of their first project back in 2005, sought-after super producer 9th Wonder (formerly of Little Brother) once again teams up with Black Moon and Boot Camp Click's very own Buckshot Da B.D.I Emcee, picking up right where Chemistry left off! After a slew of Duck Down releases hit the market to much fanfare, the triumphant return of the BCC has helped pave the way for many members of the group to continue to put out high profile projects such as these. And with 9th Wonder's still pending Wonder Years, among other projects rumored to be in the works, The Formula is just the right mixture to tide us over for now. Featuring guest appearances by Jazzy Jeff, Ladybug Mecca and more!